Key Words: chronic kidney disease of non-traditional sources (CKDnT); maquilas; labour conditions; plantation agriculture; Nicaraguan Institute of Social Security (INSS); social security. Alberto José Legall López (AJLL): Well let’s mention to you a little about PASE. This association was founded in 2003, and its original source grew from a women’s movement in Nicaragua which was called ‘Movement of Women Maquiladora Workers’. These women fight for the defence of human rights and workers’ rights for the women of the maquila; I don’t know if you understand the term ‘maquila’? AJLL: But it is the preparation and production of textiles. We were founded in this initiative, because at that time there were many abuses of human rights and workers rights; and there was an international campaign to put pressure on North American and European clothing brands so that they correctly improved their codes of conduct. So from there we originated and we’ve been monitoring these in Central America. Initially, then, our main experience was on the issue of maquilas. However, in the relationships that we were developing we were getting to know North American associations, like the ILRF, the International Labour Rights Forum. Also, SAI, which is Social Accountability International, amongst others, were motivating us to work with agricultural issues. We began to research and work on training and accompaniment to the unions and businesses about the issue of human and labour rights in the west of the country, principally with bananas and sugar. We have experience in collaborating with other economic sectors such as coffee, tobacco, but this has been more at a level of events or multi-party forums. I don’t know if you understand that word, but it is where businesses, unions , government institutions, civil society and international organisations … all, participate. So that was a little summary of what we do. In 2005, we did our first investigation with ILRF about the labour conditions around bananas and sugar. They’re on their web page in English; I can send you a link so that you can go over them. And from there, from that investigation, other organisations began also to develop and to understand more about this issue of the epidemic of chronic kidney disease. 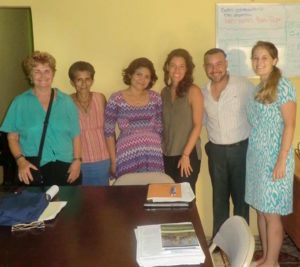 We were one of the first organisations in Nicaragua that undertook this type of research. We focus on different areas. One, we want to develop educational materials at different levels, like this. For example, this is a simple piece of educational material that was distributed in a project that is called ‘to cultivate’; we made more than 5,000 copies, and they were delivered to all the banana and sugar cane workers. This was a basic document and was used by the unions for their training. It is set at a basic educational level. This educational material is more complete: from the Social Security, and it’s what we are using at the moment. This is what we’re using to train the community leaders, union leaders, workers who have problems with social security. Also, it is used by unions and state departments as a reference. This is a little more complicated, more complete and more complicated for workers who have a basic level of education. MM: I have read a little about it, 125pages. AJLL: This manual we made is very complete, principally because we identified that the subject of social security is very precarious here in the north of the country. There are workers who spend their whole life paying in to social security and when they are sick, about to die, they take pensions of 30/40 dollars a month. This is a rip-off which is happening. There are many companies who take away the money and so there are people who have had big problems. There is one company – ‘apparently’ – although we can’t say it. But there is certain complicity between the state and these large companies. So it is a big battle and we have to be very careful. So, for us, the project has a low profile. One: we do not have open publicity, because when there is this type of issue here in Nicaragua there is a lot of repression. Because, if groups of workers have a campaign or demonstration, many of them are arrested; there have been assassinations, because they are against, they are trying to, or somehow they are affecting the millions of dollars that these sugar refineries shift in the sale of sugar. For example: they depend on sugar to Coca Cola. Pellas, who is the owner, has a liquor business at a global level, we are talking of multi millions, or billions. So, many, many millions of dollars at stake. Yes? MM: Between Pellas and …? AJLL: Yes, exactly. So it’s a very sensitive topic, very complicated and has a political/economic aspect that, if managed at a very public level, can affect our clients who are the workers we help with their pensions. They could lose their jobs, and we could put at risk our lives, our security. So there is a leaflet that we distribute and we only give a telephone number. This is an information leaflet that we give to the people, where it only gives a telephone number and basic information. MM: For all the workers? AJLL: For each client that we identify. We have a filter. AJLL: With the Community Centre which you will get to know in the afternoon, firstly we identify if the person who is looking for us really has a need or is a spy for the sugar refinery and who wants to extract information. And after we have made this filter, we attend to their needs. It is a little complicated in this work for the reason already mentioned to you, no? Already we’ve seen cases of lawyers or offices that have been closed or end up arrested because they have gone against this system. So we have to do this in a way that is more opaque. MM: And their backgrounds are suitable? AJLL: Yes. I am a lawyer. I am an investigator because I have developed distinct grassroots investigations. I am a lawyer, I defend the subject of labour, human and environmental rights, in different economic sectors. So, more or less, this is a little of the experience we’ve had. And on this basis also, so that you know, we focus, we try to develop relations on a multi-party level. That is to say we have a connection with the unions; we try to develop relationships with companies, with state institutions, the community leaders, union leaders, civil society organisations and also international organisations. So we try to have a certain balance, in such a way that allows us to be able to manage in this type of environment, which is a little difficult. These are examples of some of the investigations that we have undertaken in the past. So here, I am talking about the maquila; we undertook this investigation at a regional level. Yes, it’s more or less, must be like your book. AJLL: Yes. That’s about the issue of the maquila. When we were looking at the subject of the brands and the violations of workers and human rights. Yes? MM:I can say that your first surname is very appropriate. AJLL: Yes, yes. Legall. Yes, it fits very well. MM: When I saw it for the first time, I thought no, no it is a title, a position, it couldn’t be a surname. AJLL: (Laughing) Yes, Legall. This is another investigation that we did. You can take those that you’d like, the others – no problem, do not worry; we are not going to feel that you are undervaluing us. This we did on the theme of the obstacles to accessing labour justice. Also it was a comparative analysis in Central America, and those issues appeared, those of Communal Justice. So there they are. I won’t show them all because it would be … well, you’d have to carry another travelling bag, but they are some of the investigations that we have undertaken during PASE’s time. And this is another investigation that we did about the subject of the maquila. AJLL: That’s why I decided not to show everything, only those which might be of use to you. MM: Yes, many thanks. You have a lot of useful information. AJLL: And this is a more complete summary of the project that we are running, which you can look at in your own time. However, in a minute we are going to give you a basic description of all the work that we are developing in the office – with Josephine Weinberg. JW: Do you have all that? MM: I was wondering what was your interest, but I imagine that you can translate this into Italian. Ciara (C): No, I can be the link …. because I have done my Masters degree in English. C: Yes, and I have travelled. No, it was in Italy but it is a Masters degree from the United Nations, so it was in English, of course. MM: Perfect. All good. (Translating for June Mowforth) His friend has just finished her Masters degree. AJLL: So, this office was established a year ago, we had an approach after a United Nations project which we were developing. We knew the Isla Foundation, which is directed by Jason Glaser in the United States. So, we had the opportunity to get to know them; they knew of our experience working here in the west, and some organisations here commented that we could be like the organisation required for this type of work and we should place an office here in the west. So we initiated this experience in June last year, and we said that we would try it for a year and see how it goes, because at that moment there was a lot of repression by the state. Jason was denied entry into Nicaragua, and a lot of things have been happening. AJLL: It was intense yes. And there was a lot of repression, a lot of people locked up; there were two assassinations, so…. AJLL: Yes. So when that incident happened we decided to change strategy. Jason cannot be here, we needed an office to operate on the issues of labour rights and human rights, for the sake of advising the clients. Then they asked me if I was prepared to take on the challenge and the risk; and I said yes, that it was part of my line of work. Maybe this has made the project a little more difficult, a little more complicated due to the pressure that might be generated, be it from the state or the companies. However, it motivates me because it’s something that develops and I have a lot of experience working in this field. Before with Jason, they were a little more open on the subject of repression, and this was one of the reasons why the State and the sugar mills criticised the name of La Isla and Jason, and for this, they were very strict with them. I suggested to them that if we were going to continue working on the theme, we would go in their shadow, with a lower profile, forming a network. For me, I told them that it was important not to work in isolation. At the time of the setting up of the office, there was no network or collaborative work. I mentioned to them that if I worked in this office, I would develop collaborative networks. It is because of this that we are working with different organisations to be united in this struggle. And we need a low profile, not to attack the State strongly. So we have some contacts within the INSS, which is the Nicaraguan Social Security Institute, who collaborate with us in a certain way; also, they know our manual. So we have tried to carry out our relationship a little differently. Not directly confrontational, always being critical, making observations, but so that they do not perceive us as an organisation that wishes to overthrow the Party. Because when the Party feels that you want to overthrow it or remove its power, that’s when they are going to eliminate you. MM: Yes. We are aware of that approach. AJLL: Exactly. And that is why, as Jimenez says, a report that we are developing, is going to be like our investigation but will be of the office. We are also being careful, as the language that we use is critical, the observations, the suggestions, mustn’t be too strong or too hard. AJLL: No confrontation, principally because we are in an election year. AJLL: So for us there is a lot of pressure. So we need to be very careful in what we are doing. This is a little of the history of how we were born, no? In the project we have various lines of work. One of these lines is legal assessment, which is the attention to workers, ex-workers and their families, covering access to pensions or modification of pensions when there are violations of this right. So we work with people who are in receipt of a retirement pension – that is to say they are insured. That is our principal group because we also identify the violations of human and labour rights which is what allows us to compile the information for our reports. So this is very important, attention to the client. And we identify where the violations are to be able to prepare constructive criticism to the state and the companies. That was one of the key points, giving attention to the client on the subject of Social Security. The other area is the development of didactic and educational material, like the one we showed you, the 125 pages. And we intend each year to prepare a new updated edition. The state is always making reforms to these laws, or makes modifications to their politics. We have to update this information so that the worker is aware of the changes that happen. One weakness of the state and of the companies is when there is a change which they do not tell you about, they (the workers) lose access to many rights because of not knowing them. So, it is to maintain updates for these educational materials for society. So we are always giving them follow-ups to the reforms and the changes to the administrative policies which are happening in respect of social security, to update these educational documents. The third subject we are developing is the training: training leaders of communities, union leaders, civil society organisations and our clients, the workers, ex-workers and their families. So that they know their rights and also so that they are able to reproduce information in their communities or in the workplace. And the fourth point we are developing is our policy reports which we are going to do annually. The objective of this report is to make, as I told you, constructive criticism of the State, but also at an international level so that they know what is happening. For example, organisations like the World Health Organisation, or ONITENDO (? ), or many international organisations, do not have the updated information of what is happening in the country on this kind of topic because the state does not put this information in the public domain. So what matters is to be able to share, make international alliances and also local alliances for the fight against this situation. At the moment we are focussed on themes of social security, on the subject of sickness and on one of the state’s institutions called the INSS. However, we intend to expand. The Ministry of Work has a lot of difficulty with employers on the topic of supervision. So we are also thinking in the future of making a manual about the subject of labour rights, aimed at the Ministry of Work. We are also interested in expanding to have another type of client in the banana sector. There is a great weakness in the banana sector, those who have insurance, the workers who are insured, they have an insurance that is … outdated from the decades of the 70s and 80s. And they are still using it. This is to say, the new rights which have been incorporated for the workers in general, do not apply to the banana workers. And for us it was a very hard fight. …. So that you also understand a little of the concept: my father was the one who introduced me to this world. At this moment he is a civil servant with the Ministry of Work – yes, he works and operates here in Nicaragua, so we communicate a lot, principally as he knows I am on this project, he is always giving me recommendations. This then, is the other aspect, the report which we are developing and we are interested in developing in the banana sector, and probably on other aspects. But initially at this moment we are interested in the subject of sickness, which is something very big and what we are seeing is that there is a tendency, since 5 or 8 years ago, international pressure began so that the companies would improve the labour rights of workers in the countryside. The sugar refineries began to mechanise the cutting of the sugar cane on their plantations. What has happened? They’re replacing the workforce. But all of their workers are falling ill. So, they are not confronting this problem directly; rather they are avoiding the problem. So, 5 or 10 years ago there were always tens of thousands of workers in the countryside that were available for the plantations. Since the beginning of the mechanisation process, there are now only a few thousand workers, but there are many thousands who are sick. MM: And without social security. AJLL: And they were without social security. Many of them are unaware that they have this right. At times, when the worker dies, the widow and the orphans did not know that they had a right to a pension. So all of this information we try to give to them. Because all of this money remains in the INSS, that is to say, when the worker dies, the widow and orphans have the right to receive pensions, and the way they manage the probation period means that the money stays there [with the INSS] and they remain unprotected. And all the time the precarious conditions of the families of the countryside get bigger. Each time a worker dies the life of that family becomes more precarious. However, they have the safety of a social security net, for at least a monthly benefit, something for all the effort that the worker made. So it’s a serious issue. It is also big because they consider that the INSS is like a private bank of the state, because they manage a lot of money. Here all of the companies make a contribution and they take money from their workers to make a contribution. So for the state the INSS is a bank which manages a lot of funds. So, they try to reduce the amount of rights that the workers have, and that is the struggle that we have – to avoid this private bank continuing being as it is currently, and rather that part of its benefits go to the least protected workers. So, this is practically the fight that we are developing. This first year has been very interesting for us: we’ve identified how we can develop the network of work. For this, we allied with [Edil]Berta. [Edil]Berta is a communist and union leader with many years of experience. She has very good relations with the state, but is critical of the state. And also, she is a person with a big heart, to collaborate. So she forms part of our team. When we see the video, she appears in the video. MM: Yes, let us see. AJLL: Berta forms part of the team. We are forming the team at the moment. Me, Josephine, who is in the USA making all of the relationships, an assistant/intern who at the moment is our friend Ciara and Berta. In this small team we are trying to give answers to all the citations. There are other people who collaborate with us, who you will get to know. One of our trainers is called Pablo Casco, who is the legal assessor of an organisation called Association of Rural Workers [ATC, by its Spanish initials]; they have a presence throughout Nicaragua. He is also a director of a clinic called Flor de Sacuanjoche. So we try to make it so that our allies are people who are going to support us or who are able to back us in this struggle. In fact, in the future I think that with the Flor de Sacuanjoche clinic we could form an alliance. For example, at some point, we are thinking of offering free examinations of peritonitis, to allow us to see how advanced the illness is. They are available to do this for free – maybe if we find in ENCA or one of these organisations someone who could donate the medical equipment which they need to undertake these examinations, they are prepared to do this? AJLL: In the clinic, yes. MM: And in other clinics as well? AJLL: In others yes, but this clinic is the one that is being seen initially with us. It may be where Berta is as well. But this clinic has the advantage in that it has the authorisation of the INSS so that their examinations are valid. So, in the case of clinics, this is why we look for clinics that have the recognition of the state. So in the future we could undertake this type of … we only need to obtain what is necessary to carry out the examinations for all the workers of the countryside; and the clinic is available to do the charts with their doctors, and we’ll run a campaign so that they admit themselves for an analysis. When we are there with the doctor we will be able to talk about this. We have another ally which is the Ramon Salvatierra Union, the union which is from the Monte Rosa Sugar Plant. They are very active; they form part of a national federation of sugar unions, also the International Federation of Sugar Unions of Central America. They are also strongly allied, and I believe that you might be interested to get to know them in the future, because they provide information that we can share here in the book and in our relations with yourselves. I think that I am mentioning this to you to make the most of the meeting, they will probably mention to you some of their interests. Maybe right now an interest of the union is that there is a weakness at the sugar mill. When they want everything to appear well, in the cutting of cane, for articles they provide you with a camera at the mill so that you can take photos; however, when there are violations, they prevent it, they don’t offer a camera to you. So for them there’s a huge need [for us] to have a camera. Because it is like this, when they see that there is a violation of rights they will be able to take a photo and make it public. And so when we are discussing the possibility of capital investments, a big necessity is a camera, to provide evidence of the violations that the mill will not let us demonstrate. So these are some of the subjects that I believe they may mention to you so that you are not taken by surprise. AJLL: Holland, from Holland. For problems in … there has not been a good relationship between Jason’s strong position and this organisation; so there have been some differences in the management of funds. And they told us, well, we are going to cut your funding until May, this month. That is why we are starting this campaign in the United States for the next months of the year, whilst we find a stable ally for the long term. Next week we are going to receive a visit from another Dutch organisation which is the National Confederation of Unions of Holland. Mario Lys of the National Confederation of Unions of Holland is coming to get to know the project and to see in what way they can support us. In the case of ENCA, I thought that you could help in two ways MM:. One: in the short term, there is a campaign we are running where we are raising small funds. I’d like to know if you are interested in our project and what we are doing. If you can get all of the ENCA members to be aware of this page and although you may only donate a dollar, for us that is a lot, because with all of the activists this will allow us to continue reaching the goals for the next seven years. MM: Is this through Pay Pal or …? AJLL: If you can, you can pay by card … We know that you do not have a lot of resources, but you have the connections. You have a network, you have all of these organisations who you work with, their members and their funders. So I think that if you could try and run a small campaign with them, and your friends there; and if they can manage at least 1 dollar, 10 dollars, 15 dollars, this can help so that we may have more months of continuing in our project. Unfortunately, with these differences which happened between solidaridad and Jason, well we have come out worse off. But we continue with the struggle. Can we take a look a look at the manual? We’ve been thinking again about bringing out a new edition – this is the first edition. Here only the organisations that collaborate locally appear; ATC appear, La Federation [Edil]Berta appears, the union, the sugar mill and the clinic. So, for example, in the future, next year we might collaborate with ENCA or Santa Rosa; here I could bring to attention a special mention to the funder, and for us it is important that they know us. In this first edition I didn’t mention Solidaridad because they preferred not to appear – it’s a complex issue. The same would be for you, if you said to us: Alberto, we do not wish to appear in the list of organisations – well that is understandable. Because this, this little book is aimed at the workers but it might end up in the hands of a businessman or a functionary of the state. AJLL: But as this an information/educational document which is not attacking a political party; so this has been accepted. So this is the advantage that we have, that the strategy which we are managing is positive. So we think that the collaboration for now is to develop the second edition of the manual for the sake of imparting the training. For us, we will distribute this manual at the training to the workers; this could be a collaboration between us. AJLL: Another collaboration that we could have that would require a slightly smaller fund, is that we, these workers, as they are of limited resources, we can offer them the journey to allow them to join us when we have to travel somewhere. JW: But the travel allowance? AJLL: The travel allowance, yes. We have a register of the money that we give for journeys, or at times, we have to undertake examinations, and we cannot do it for free, we have to pay. So that assistance is so that they can travel. JW: Here is an examination of a woman that has been done. AJLL: Yes, or we have to travel to Managua, so we cover these costs. So, for example, we point out on this page what we will give each of them, with their signature, but if we were to receive help from ENCA, or Santa Rosa, we would produce a page which carries the name of the organisation giving this money for transport or examinations. And the fund is a little smaller, which helps them, (the workers), so that they do not have to use their own money. I am trying to identify the areas in which we could collaborate. MM: Yes. Tell me how much you need for the edition. AJLL: Each of these booklets cost us 3 dollars to make. 3 dollars each. That includes everything, because there are a lot of pages. MM: And how many do you want to produce. AJLL: At first, we were with the Solidaridad Project and we made 1,000. The goal is maybe produce 1,000 each year. 3,000 dollars. But we believe that it is necessary because, for example, at the moment we are left with only 200. We have already distributed 800, and there is the need for more, because there are thousands of people that need this information. So, with a thousand each year we believe that at least minimally we are trying to reach out to each community. And what we tell them is: listen, we are leaving this booklet in your house, but try to get other families to get familiar with it. So, we believe that one thousand examples a year is like an acceptable target. But if it’s too ambitious … it’s also used for the training. So, it has a double purpose. So, basically we initially thought that we could do something like this. But then we realized that there are so many violations that we had to do something more concrete. And we are very satisfied, all of the organisations and the workers are very satisfied, because here [in this publication] there is all of the information that they need, to undertake the procedures, the functions. What the INSS does not indicate, here, we explain everything. However, as every year they make changes to the laws and are able to change the internal administrative policies of the state; we are getting out each year updated editions, like updating the information. There are small funds that I believe that we can still collaborate on, that are not ambitious, and for example we are not asking for an annual budget to run the office – that could be very big. We hope in future, maybe with the collaboration that we might have between ourselves that one of the funders that you mentioned might want to support this office. But also they undertake activities like those that I mentioned to you …, and I believe that these areas can be very important. So that is what initially occurs to me. But yes, it is important, MM:, in these moments, when we are seeking funds. I believe that right now with the campaign, at the end of April, we have already raised funds for the next two months: June and July. However, we are searching (for funds) for the rest of the months. I don’t know if you have any questions? If you want to say something? MM: I have a few questions about these possibilities and some things to say. AJLL: Perfect. Would you like to watch first the video and talk afterwards? Edilberta Gómez (EG): I worked 4 years on the Cultivar project, with the training, with all of the banana workers. And this experience, really made me learn a little more of the organisational part. EG: Yes, this one. And I say that it was very important the work of those who came to talk to the banana workers. Because it was like we had a coffin, merely to know our duties and our rights, even though working with the unions, right. But no, they never supported us directly in reality, right? And I’ve seen the work that they’ve been doing, which has been excellent work, special work. And the social work I also point out, because in reality in our country it is needed a lot. The brief remainder of the recording involves Alberto and Edilberta discussing – often inaudibly – their work in helping sugar cane and other plantation workers, and their families, to receive the pension to which they are entitled when they fall ill because of CKDnT. They mention the need to involve the INSS [the Nicaraguan Institute of Social Security], but also the gaps that the INSS leaves when informing workers, gaps left, possibly deliberately, to avoid the payment of pensions and sick pay. So PASE has a slightly awkward and difficult, but necessary, relationship with the INSS.